Neither Russia nor the United States are rushing to destroy their smallpox stores, in favor of further research and in the case of the disease’s resurgence. Jo Treggiari, in her debut novel for ages 12 and up, provides an apocalyptic tale combining extreme climate change and mutated smallpox of unknown origin. The writing style and content of the tale set a tone of panic, fear, and despair as a response to extreme calamity as researchers search for answers. The heroine, Lucy Holloway, is living alone—her entire family is gone—when she is discovered by Aidan. After New York City and the rest of the world are ravaged by earthquakes, flooding, and long wet and dry seasons compounded by multiple plagues of smallpox, she joins Aidan’s settlement. The overriding mystery of Ashes, Ashes surrounds Lucy and why she is being hunted and by whom. There are a few episodes of girl-boy love interest, but it is appropriate for middle grade readers. Elements of dystopia recall such recent offerings as Suzanne Collins’ The Hunger Games and the wilderness survival angle is reminiscent of the Brian books by Gary Paulsen. Unfortunately, the writing competency is not at the level of these other books. The overall plot premise is compelling, but the telling at the beginning and end is rushed and dispassionate. 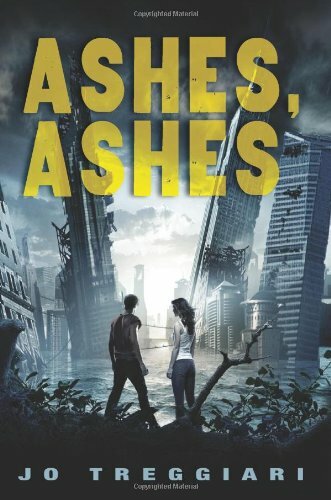 The middle portion of Ashes, Ashes shows the most depth in writing, plus passion and growth regarding the protagonist, in which Lucy learns things that challenge everything she’s ever learned. She grows from her experience at the settlement. The middle of the book also contains some interesting characters: Sammy, a smallpox victim and one of the rare survivors; and Grammalie Rose, who is reminiscent of a wise elder of Native American culture who leads the group and makes sure that the necessary work is done to sustain them all and that empathy and kindness within the settlement prevails. But the writer cheats us by leaving us with too many loose ends at the end of the book—regardless of the fact that a sequel may be planned. There are many examples where the writing needs to be tightened, but one inconsistency that really stands out is a continuing scene involving Lucy and a turtle. In the first chapter, entitled “Turtle,” Lucy is learning how to fillet a turtle. She takes the “corpse”—meaning dead, right? No, she has the turtle bite a stick; then she chops its head off—okay, now it’s dead, right? No, later in the chapter Lucy thinks that this turtle “isn’t getting any deader.” Further revision and editing should have caught this. Secondly, the flooding seen with climate change doesn’t make sense—some semblance of New York City exists yet half of Australia is gone? Odd inconsistencies like this leave one wondering if the story had not fully matured in the writer’s mind—or perhaps that her editor was asleep at her desk. Regardless of the cause, an astute, well-read 12-year-old reader will notice these bumps. Perhaps Ms. Treggiari’s next novel will be more refined: less rushing to tell a story, more showing as opposed to telling, more consistency, and answers to questions posed in the course of the narrative.